They are designed for fleets, but appear to be Android tablets that run the Nuvi (fleet 660) or Dezl (fleet 670) software. The fleet 660 for $400 is comparable in price to the high end Nuvis. What especially interests me is the customization through apps and peripherals. service providers can introduce customized applications and value-added services that meet the unique requirements of their customers. The new devices also connect to and control a wide range of external devices over Wi-Fi®, Bluetooth®, or serial cable. 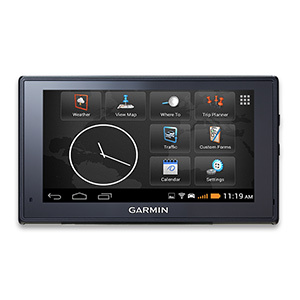 “The fleet 660 and 670 are our first fleet products that combine trusted Garmin navigation and hardware with the flexibility of Android,” said Chad Sallman, Senior Business Development Manager for Commercial Solutions at Garmin. “These new devices remove many of the hurdles fleet service providers face today, making it easier than ever to develop customized solutions for both medium and large, enterprise class customers.“ The ubiquity of the Android platform makes fleet service providers less dependent on third-party technology companies when developing customized fleet solutions. Providers can easily integrate existing applications from their partners for signature captures, work orders, or inspection reports, for example. The easy-to-use interface is fully customizable and applications and widgets can be added onto the device home screen. Amazing that they can do a Nuvi or Dezl app for Android for the fleet market but the only thing they do for the consumer market is that piece of crap Viago. They also have the "Garmin Outdoor App" that runs on the Monterra. Would love to be able to install this on a tablet, but it isn't available for the consumer market either. Garmin's usual set of "Outdoor" applications along with a few unique ones are coded as a single Android App they refer to as Garmin Outdoor. It is installed at the root level of the Android OS which means it has control over some of the Android OS features -- much like wireless providers and cellphone manufacturers do on your smartphone.